We love to craft and are never at a loss for ideas! We look for the latest trends in home decor and jewelry and bring you an edited assortment of those projects. We make sure our projects are easy to do, and we’re here to help as much or as little as you’d like! We do Private Parties & Events, as well as offer Open Studio time, where each person can choose a different project. Check out the options below, then browse our calendar for available dates & register to attend. 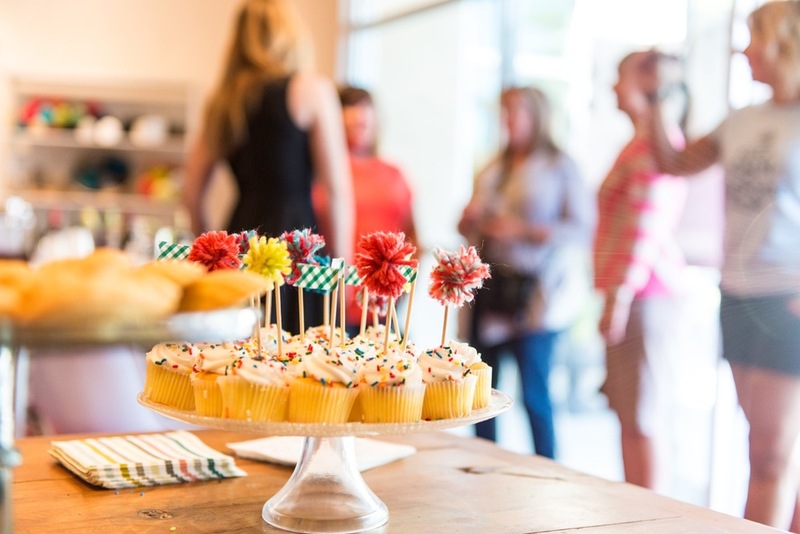 If you have 18 people, you can reserve the studio for a private event. If you have less than 18, your group can register for an Open Studio. We have many Open Studio times on the calendar where you can make any project we offer. Register & pay deposit to reserve a seat for an Open Studio. Host your daughter’s birthday party with us! We have a variety of fun, simple projects they can choose from. We’ll keep them happy while inspiring their creativity! For ages 8 & up. JEWELRY $25 & UP | We change our jewelry options based on style trends. Not all styles may be available at all times. We pride ourselves on quality stones that you will be proud to wear. You can choose what you would like to make - earrings, bracelet or necklace. These are some examples, but you will be able to adjust and personalize however you’d like. BOHO HOME DECOR - $45 | Choose from a variety of yarn & ribbon, make tassels and pompoms to design your dream catcher or wall hanging. WOOD BURNING - $50 & UP | We offer uppercase, lowercase & numbers to burn in the wood piece you pick. Wood options vary depending on availability. CUSTOM GLASS ETCHING DESIGNS - $55 | If you want a custom design, we can work with together. Register, pay the deposit and then email us at info@redsealcraftstudio.com to discuss what you would like. 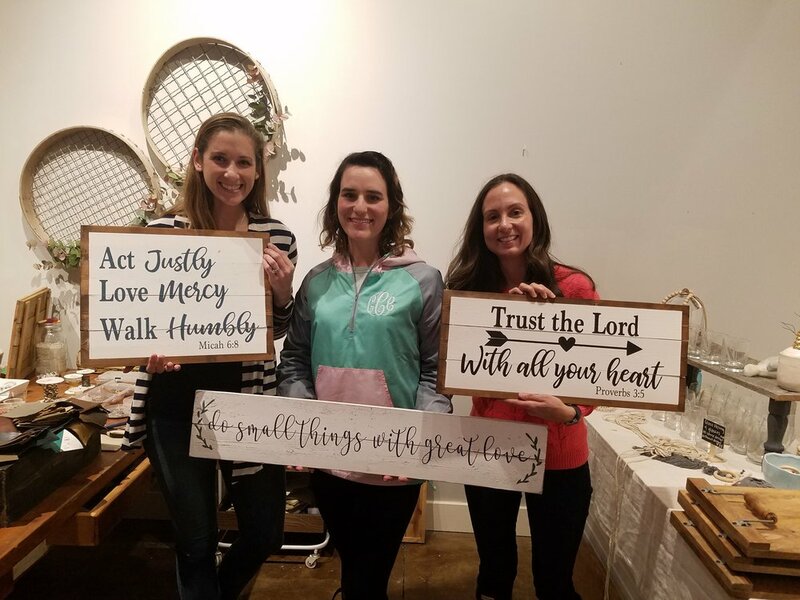 WOOD SIGNS - $55 & UP | When you select a sign, you will be prompted to 1| Pick a sign style from our family name signs shown below or choose a custom size 2| pick a stain color 3| give us the details needed to format and cut a custom stencil for you. You will pick the paint colors when you arrive. CUSTOM SIGNS - $65 & UP | We love working with clients on custom designs. If you have a special quote / motto or you have seen something else you would like to make, choose the custom option, pick one of the sizes & stains we offer and then tell us what you would like. 4-5 lines is the largest on the $65 & $70 signs. You can also email us with pictures or other details at info@redsealcraftstudio.com. Check out the slideshow below to see what others have created! FIND A DATE - Check out the calendar below for our current schedule. Don’t see the date you’re looking for? Email us at info@redsealcraftstudio.com, and we’ll do our best to make it happen! COME GET YOUR CRAFT ON - Arrive at the scheduled time. You can bring drinks and snacks to enjoy while you craft. We’ll be here to help as much or little as you’d like! In order to plan effectively you must register through the calendar to attend an event. Hi - I’m Christy! I am a mom of 2 daughters & a wife to an amazing husband who has always supported my wild ideas. Creativity has always been a part of my life. Growing up, I was surrounded by inspiring creative women. My grandmother was a clothing designer and artist, and my mom is a talented photographer and craft enthusiast. For as long as I can remember, we have been making things together. I am an HGTV and Pinterest junkie, and I love coming up with new project ideas! I’m also a social butterfly, always looking for fun things to do with friends. When I discovered Red Seal, I knew it was meant to be! I can’t wait to craft with you! Have a question, comment, or request for a custom project? Just fill out the form below, or email us at info@redsealcraftstudio.com. We look forward to chatting with you!